Reading Blaster Ages 9-12 Game Review - Download and Play Free Version! Dr. Dabble is Turning People into Appliances and Only Your Reading Skills Can Stop Him! Mystery storyline is interesting and thought provoking. Reading skills (diagramming sentences, comprehension, etc) are nicely incorporated. Over 75 unique mystery stories. The mini-games could easily get tedious. Solve the Mystery of an Evil Madman! Dr. Dabble is kidnapping people and turning them into appliances! Can you save them and figure out why he's doing this? This mystery adventure game is a great way for children ages 9 to 12 to practice reading comprehension, grammar, spelling, critical thinking skills, analogies, vocabulary and more. Children are sure to enjoy the feeling of being a detective and searching for evidence throughout the mansion! A piece of evidence is earned for each activity completed. Activities include building sentences in a memory graveyard game, practicing synonyms and antonyms by jumping on moving ghosts to find the correct words, working on comprehension and critical thinking by solving logical word puzzles, building a bridge by finding words that relate to each other and more. Make Reading Fun and Memorable for Your Child! This game is rich with mystery perfect for children ages 9 to 12. They'll feel rewarded as they put together the pieces of the mystery and greatly improve their reading skills! With various difficulty levels for each activity and nice touches like short stories scattered throughout the mansion, children will want to play and replay this game for endless hours! 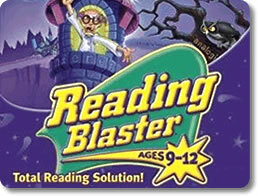 Give your child education and entertainment now with Reading Blaster Ages 9-12! In this edition of Reading Blaster you must help Rave navigate a mysterious mansion in search of his friends that the evil Dr. Dabble has trapped and hid in appliances. Through completing challenge word games and scanning the house for clues, you uncover evidence that can be used against the doctor, foiling his plan and saving your friends. This educational word game helps with building sentences, identifying synonyms and antonyms, grammar, sentence structure, and critical thinking. This game might be the perfect tool to keep you or your child interested in learning, as it's both fun and educational. Solving the mysteries is the most fun and adventuresome mode in this game. There are over 75 to solve, each incorporating multiple word related games. In the mysteries you must uncover clues through completing games, decoding notes, and finding hidden objects. The clues give you hints about which lost items go with each lost person, so finding them is crucial in saving your trapped friends. Examples of items you might pick up are chicken, a football, a necklace, photos, and more. These items, when matched correctly, are used to reverse the trap, freeing your friends from their captivity. Each room in the seemingly abandoned mansion houses a different word game. These games consist of building sentences, practicing grammar, and critical thinking. For example, in the graveyard you must accuratelly arrange the tombstones so they correctly build a sentence. Also, in the parlor you must play a game that asks you to build sentences based on the part of speech, similar to a mad lib. Both these games help with building sentences and identifying parts of speech. In both you must be able to identify the subjects and the verbs along with adjectives, adverbs, and direct objects. Other games help with critical thinking and logic. While in the dining room you must read a word problem and identify the correct sequence. This problem can be confusing and requires strong reading comprehension. On your way up to Dr. Dabbles lab you must climb stairs that follow a correct logical sequence. Each word has a correct place in order and you must logically arrange them to solve the puzzle. Both these games require logical thought and are fun ways to develop critical thinking skills. The drawbacks of this game have less to do with content and more are more based on gameplay. In terms of content and conveying the overall point this game is great, however, it does have a few quirks that take away from enjoyment. The largest flaw can be seen with solving the mysteries. Each mystery is nearly identical and solving them requires no new plan of attack or new actions. The clues are in the same place and you must complete the same games to earn hints. There is little to no variation between mysteries, so even though there are 75 in total, solving them feels the same. Another drawback can be seen in the mini-games. Sure they are educational and helpful for learning, however, they too remain the same and barely change. There are about 8 games to choose from so you will find yourself playing and replaying the same games over and over. More mini-games, or greater variation within the games would have been a great improvement, making the game more enjoyable. Overall, Reading Blaster age 9-12 is a great game and resource for your child who is developing his or her reading abilities. The mystery elements make finding clues and spelling more fun, while the mini-games also add to the excitement. Though your child might not experience the variation he or she might like to have in a mystery game, solving the puzzles shouldn't get too tedious and figuring out how to save your trapped friends should prove to be exciting regardless of how many times you've played. This is a great learning device and is highly recommended for someone looking for a fun and educational game. The Reading Blaster series has always been great, and this game is no exception.